↑ 2.0 2.1 "IMF Executive Board Selects Christine Lagarde as Managing Director". Press Release. IMF. 28 June 2011. สืบค้นเมื่อ 28 June 2011. ↑ From Ralph Atkins, Andrew Whiffin and FT reporters. (16 October 2009). "FT ranking of EU finance ministers". Financial Times. สืบค้นเมื่อ 2 January 2010. 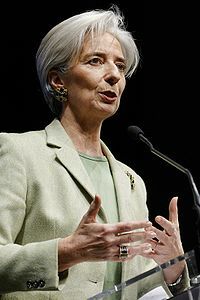 ↑ "IMF: US backs Christine Lagarde for top job". BBC News. London. 28 June 2011. สืบค้นเมื่อ 29 June 2011. ↑ "Germany, Britain back Lagarde to lead IMF". Washington Post. 22 May 2011. สืบค้นเมื่อ 22 May 2011. ↑ (ฝรั่งเศส) "Soutiens européens à une candidature de Lagarde au FMI". Le Monde. 19 May 2011. สืบค้นเมื่อ 22 May 2011. ↑ "Christine Lagarde announces IMF candidacy". BBC News. 25 May 2011. สืบค้นเมื่อ 25 May 2011. หน้านี้แก้ไขล่าสุดเมื่อวันที่ 16 เมษายน 2562 เวลา 04:09 น.